Current holster and sheath systems on the market tend to be paired with attachments that allow little to no adjustment when it comes to carry position and cant. In order to truly feel safe and secure while carrying, one must have their tools in the correct position at all times. The Accessory Mounting Plate is a solution. By providing the end user with over 130 different anchor points, the AMP allows for total customization of the way you carry. Made from Tufmax 720, The AMP will flex to the body when worn on the belt, all the while remaining incredibly durable and true to its shape. The AMP can also be utilized to pair two different carry systems on one belt attachment, for example pairing a cuff case with a torch, or multi-tool case. When not being utilized on the belt, the AMP can be used as a buffer piece between your holster body and various manufacturers attachments. When a holster system isn’t equipped with the necessary pilot holes for mounting a certain attachment, assembling the Accessory Mounting Plate to it will provide for you the necessary anchor points. Find another use for the Accessory Mounting Plate, let us know! 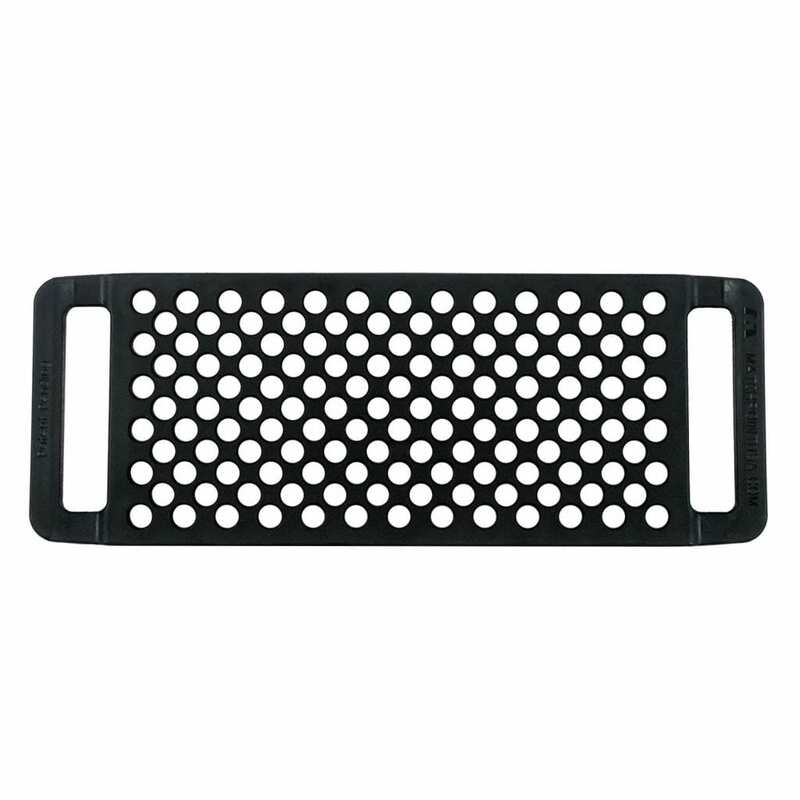 Introducing MatchPoint USA’s 1.75″ Accessory Mounting Plate (A.M.P.) This Accessory Mounting Plate was designed to allow total customization for the end user to position their carry system in any direction they choose. The 1.75″ wide loops on the end are intended for carrying on the belt. The AMP can be worn on the outside of the belt for standard OWB carry or flipped over to the inside to help conceal a fixed blade knife sheath or another thin carry system between the belt and pants. But belt carry is not all the Accessory Mounting Plate is capable of doing. When not being worn on the belt, the AMP can be used to pair sheaths/holsters with other manufacturers attachments that would otherwise not fit. The Grid present on the AMP will pair with a variety of other finished goods on the market. It can also be used to pair two different accessories together in a single belt attachment. The AMP can be utilized as a buffer between a holster body and Molle attachments seen on chest rigs. Many holster systems lack the necessary mounting holes needed to attach Offset Molle locks for chest carry on vest platforms. Mounting the AMP in between the holster body and attachments will allow for many more anchor points and total customization of the way you carry. What spacing is the hole pattern? The holes are a standard 3/8″. What are the exact dimensions of the Accessory Mounting Plate? The dimensions are 2.375″ height by 6.375″ length and 0.2″ thickness. There is no lead time, goods are in stock and ready to ship.